He was daring, wildly ingenious, passionately curious. He saw a beam of light and imagined riding it; he looked up at the sky and envisioned that space-time was curved. Albert Einstein reinterpreted the inner workings of nature, the very essence of light, time, energy and gravity. His insights fundamentally changed the way we look at the universe – and made him the most famous scientist of the 20th century. We know Einstein as a visionary physicist, but he was also a passionate humanitarian and anti-war activist. “My life is a simple thing that would interest no one,” he once claimed. But in fact, his letters, notebooks and manuscripts tell a dramatically different story. Einstein saw the universe as a puzzle, and he delighted in trying to solve its mysteries. All he needed to contemplate the cosmos was his most valuable scientific tool – his imagination. 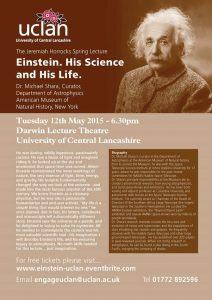 I will describe Einstein’s life, and his enduring legacy to astrophysics. No math skills needed for this lecture… just imagination. AMNH Einstein exhibition, the “Beyond Planet Earth” exhibition and several AMNH space-shows seen by millions of people worldwide. Dr. Shara’s research interests include the structure and evolution of novae and supernovae; and the populations of stars inhabiting star clusters and galaxies. He frequently observes with the Hubble Space Telescope and other large ground-based telescopes. He has published over 220 papers in peer-reviewed journals. When not doing research in astrophysics, he can be found scuba diving in the South Pacific, enjoying the company of sharks. Please contact the orgainser if you would like to book on behalf of a school group or other organisation. Please note that The University of Central Lancashire is fully wheelchair accessible and fitted with Hearing Loops throughout. 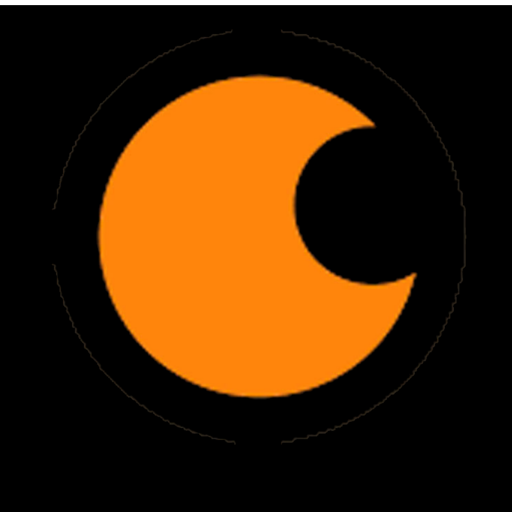 Please contact the orgainser if you wish to discuss any further access, or other, special requirements. Free car parking will be availble on all university car parks for the duration of the event (please note that Pay & Display Machines will not be operational during this time, so please do not use them). Prof. Jim Wild, Lancaster University. The aurora borealis or “northern lights” are clear evidence of the Earth’s link to the space environment surrounding our planet. These mysterious dancing lights in the night sky have captivated observers since ancient times. In regions bordering the Arctic Circle, aurorae feature heavily in the mythology and folklore of numerous cultures, but what causes these beautiful displays in the polar sky? 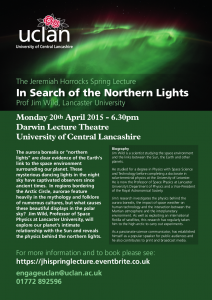 Jim Wild, Professor of Space Physics at Lancaster University, will explore our planet’s intimate relationship with the Sun and reveals the physics behind the northern lights. 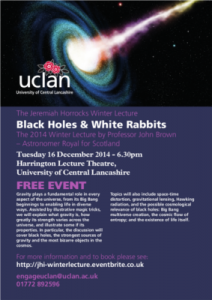 John Brown, Astronomer Royal for Scotland. Gravity plays a fundamental role in every aspect of the universe, from its Big Bang beginnings to enabling life in diverse ways. Assisted by illustrative magic tricks, this lecture will explain what gravity is, how greatly its strength varies across the universe, and illustrate some if its properties. In particular, the discussion will cover black holes, the strongest sources of gravity and the most bizarre objects in the cosmos. Topics will also include space-time distortion, gravitational lensing, Hawking radiation, and the possible cosmological relevance of black holes: Big Bang multiverse creation, the cosmic flow of entropy; and the existence of life itself. Free car parking will be availble on all university car parks for the duration of the event (please note that Pay & Display Machines will not be operational during this time). The search for extra-terrestrial life is accompanied by enormous optimism, including the idea that we will one day, with sufficient technology, communicate with other intelligences. However, will we ever talk to aliens or are we forever destined to detect only microbes beyond the Earth? Even if we want to, will we ever visit other stars? 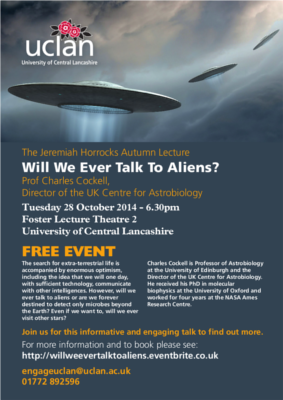 Join is for this informative and engaging talk to find out more. Charles Cockell is Professor of Astrobiology at the University of Edinburgh and the Director of the UK Centre for Astrobiology. He received his PhD in molecular biophysics at the University of Oxford and worked for four years at the NASA Ames Research Centre. He is Director of the UK Centre for Astrobiology. He is author of a number of books, including, Space on Earth (Macmillan), which explores the links between space exploration and environmentalism. Please note that The University of Central Lancashire is fully wheelchair accessible and fitted with Hearing Loops throughout. Please contact the orgainser if you wish to discuss any further access or other special requirements. Free car parking can be arranged in advance, please contact the organiser for further information.